This article describes the elements and functionality of the People page. To learn more, explore the whole People Page collection and FAQ. To open the page, log into your Reply account and click People. When you have already imported people using the Add People button, you see more options available on this page. To create a new filter list, click the + button near the More drop down menu. You can add multiple properties, including custom variables added via the .CSV file importing. 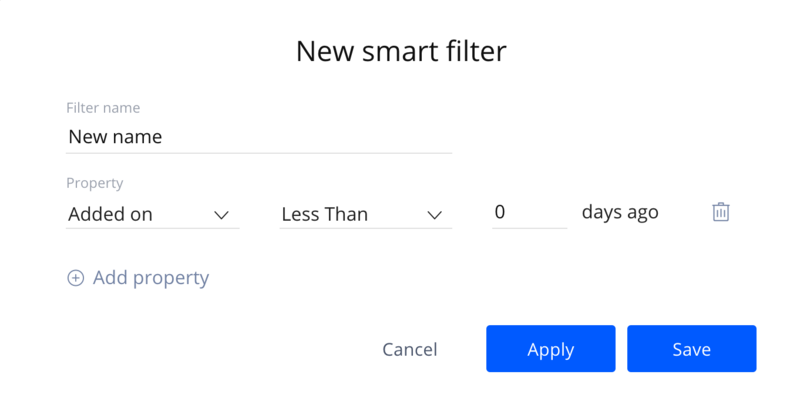 You can either Apply or Save the filter after you name it and set properties for the filter. The Apply option allows to temporary save the filter until you navigate to another page. The Save option keeps the filter permanently on the People page in the More drop down menu. 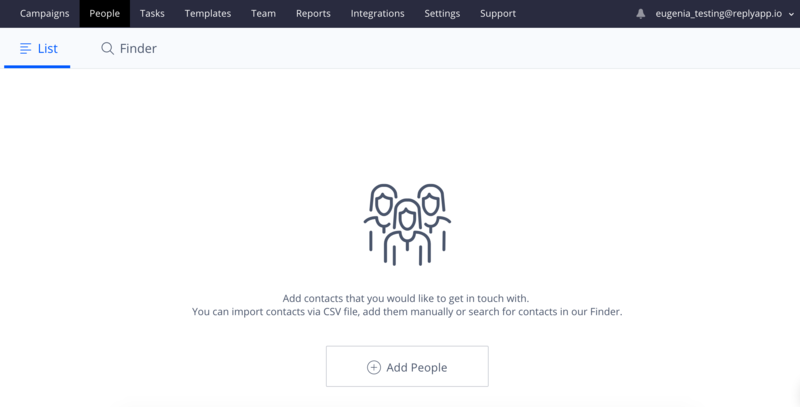 You can add the selected people to Campaign by selecting the Push option (if a contact isn't in any campaign currently), or select a Step (if you want to move contacts to the campaign to a specific step, or if a prospect is already in another campaign. 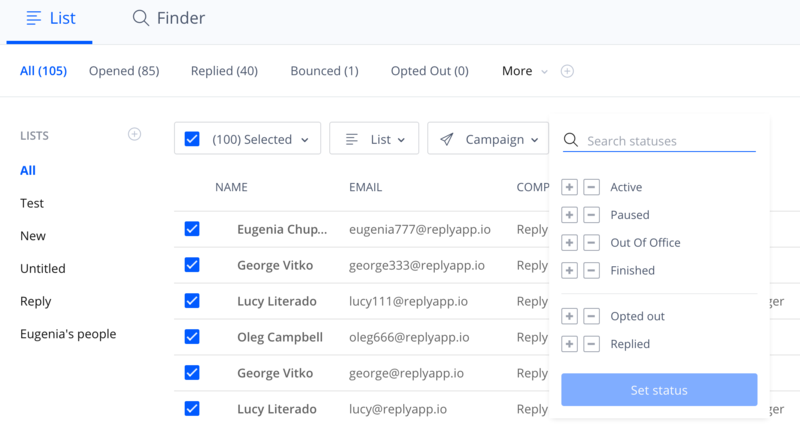 By this action, all selected people will be automatically removed from the previous campaign, and the email will be delivered immediately despite the Step setting). You can remove all selected people by hitting the Trash icon. option to Blacklist selected prospects. When you select the Export to CSV option, you can choose between exporting Basic Fields and All Fields. For more information, see the following article. 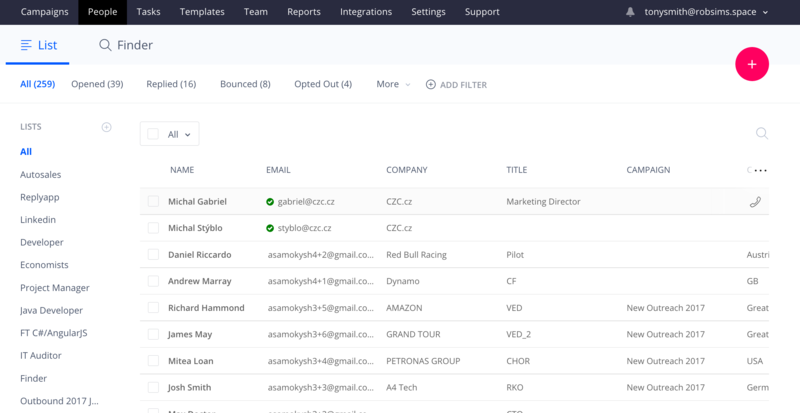 You can see the detailed contact's Profile when clicking on a prospect in the list. It's possible to switch between contacts without closing the profile for a specific one.